Not a Morning Person? Me Neither. 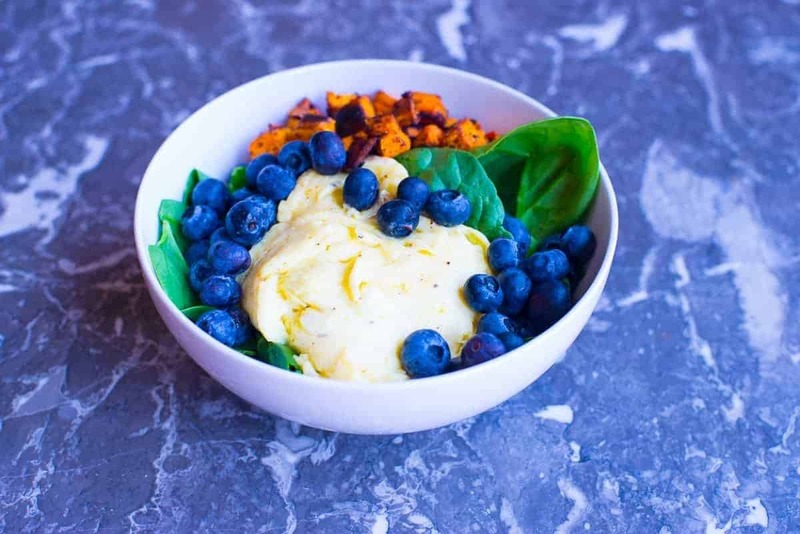 This fast and easy paleo breakfast beast bowl will have you fueled up in no time. Whether you’re Paleo or doing a Whole 30 or you just want to eat healthy, clean food, this breakfast is perfect for you. The whole idea behind the beast bowl – it makes getting your macros a total no brainer. Eating macronutrient balanced meals throughout the day keeps our hormones at optimum levels for staying focused, and keeps our metabolism running the way that it is supposed to. As typical Americans our diets have become way too carb heavy. And not in a good way – most of the carbs that we eat are heavily processed and don’t have any nutritional value at all. Good carbs are absolutely necessary for building strong lean muscle. But carbs should come mostly from fruits and vegetables and then small servings of quinoa, rice or starchy vegetables. Eat a wide variety of colorful fruits and veggies. This beast bowl provides a colorful serving of fruits and veggies, which yields healthy antioxidants and phytonutrients that give our bodies the micronutrients that we need to be our best. Do eggs and blueberries sound weird? Trust me – the combination is fantastic. I got the idea from one of my gym partners. She showed up at a comp we were doing with a bowl of eggs, bacon, and blueberries. I kind of thought at the time, ”Blueberries and eggs, how weird!“ But then I tried it, and now I’m a believer! We all know, at least vaguely, what macronutrients are – Proteins, Carbs, and Fat. But did you know that micronutrients are what really makes a difference in long-term health and longevity? Blueberries are one of the most micronutrient-rich foods on the planet. In addition, spinach and sweet potatoes are also phytonutrient rich. This combination gives you a broad range of micronutrients. How to Balance Your Macros. For this beast bowl you can adjust the amount of eggs to your protein needs. Typically if you are trying to maintain muscle mass you should eat 1 gram of protein for each pound of lean muscle that you are carrying. As a moderately active, well muscled, female I try to get between 120 and 160 grams of protein per day. I always plan my protein first, then my fruits and veggies. Eggs have about 6 grams of protein per whole egg and about 4 grams of protein per egg white. To find out why we like eggs so much you can check out this article on the best protein sources. You can use all whole eggs if you want to. However I find that I just can’t eat 5 whole eggs so I use egg whites to up the protein and keep that fat a little lower. Fat is satiating and makes me feel full, and I end up not getting all the protein that I need if I just stick with whole eggs. I plan my carbs around how much working out I am doing that day. When looking at nutrition planning, protein and vegetables should be the foundation of every meal. Then think of carbs as a fuel. The more you are working out, the more fuel you need that day. On days were I’m gonna be sitting most of the day or doing just a long walk with the dog I try to keep my carbs lower. On days when I am lifting weights I plan my carbs higher. I don’t actually measure out my sweet potatoes and blueberries. 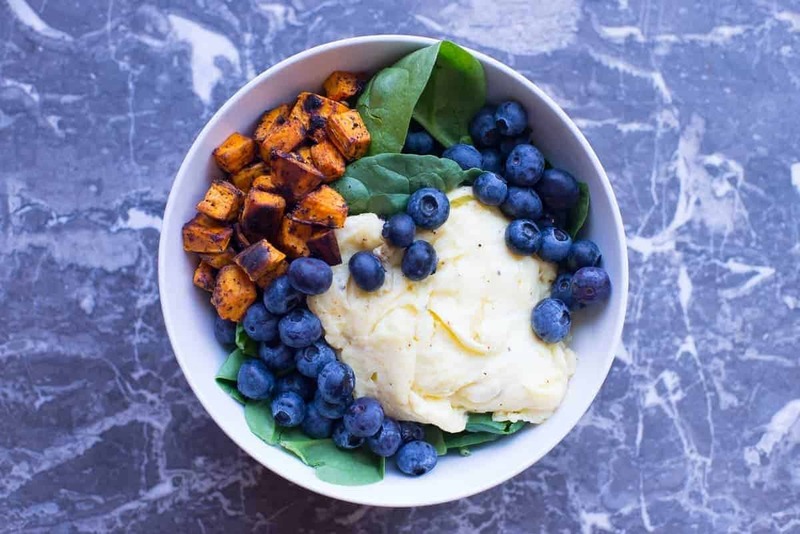 I use my hands and grab a large handful or two of spinach, then I add smaller handfuls of sweet potatoes and blueberries, think cupped palm full. My handfuls are somewhere between ⅓ and ½ of a cup. Usually, I find this way of measuring close enough. Does your meal prep game need some work? Download my Meal Prep Guide and Planner right now and learn how to get started. What’s in your beast bowl? For more healthy beast bowl tips, follow us on your favorite social media channel. We are on Facebook, Twitter, Instagram and YouTube. Following us really helps us to share more food love, so if you like what you see please share Foodology Geek with a friend! Subscribe to get our recipes and insider-only freebies directly in your inbox. Fast and easy breakfast bowl. It doesn't have to take a lot of time to have a healthy breakfast. Tried this recipe?Mention @BeastBowlLife or tag #BeastBowlLife! Beast Bowl Nutrition® is a participant in the Amazon Services LLC Associates Program, an affiliate advertising program designed to provide a means for sites to earn advertising fees by advertising a linking to amazon.com.